My name is Sean and I do Pigeon pose every day…sometimes twice a day. Pigeon is a hands down favorite in my LIVE yoga classes and I’ve taken great pains and pleasure in adding a bounteous amount of effective variations to the base pose in the two classes below. Areas we’re addressing, improving and bringing life to include: hips, low back, shoulders, back, rhomboids, hip flexors and other areas we were unaware needed attention. Expand your yoga practice further with my award winning 7 Day Yoga Challenge! I find such great joy in bringing you these unique and therapeutic classes and flows (like my latest Eagle Stretch Program). Please return the favor by liking, subscribing, sharing and commenting for each video. I appreciate it and thanks for training with me and sharing me with others! The #1 Bestseller on Amazon! This complete bodyweight only program is for the total beginner (perfect for men and women of all ages and fitness levels) who wants to increase their strength, flexibility, power and overall health and fitness using only their bodyweight. You’ll see dramatic results after the very first workout! This book is for the total beginner (perfect for men and women of all ages and fitness levels) who wants to increase their strength, flexibility, power and overall health and fitness using only their bodyweight. You’ll see dramatic results after the very first workout! Sean Vigue is one of the leading fitness instructors in the world, the “most watched online yoga and Pilates guy” and was recently named one of the “Top 50 Online Workout Resources” by The Huffington Post. He’s worked with thousands of people in his live fitness classes and millions more online around the world in over 100 countries. You will not find a more passionate and entertaining instructor! He’s the author of the bestselling paperback, “Power Yoga for Athletes” from Fair Winds Press and the popular eBooks, “Pilates for Men”, “30 Days of Planks” and “30 Days of Flexibility Training”. He loves what he does and is excited to share this program with you! 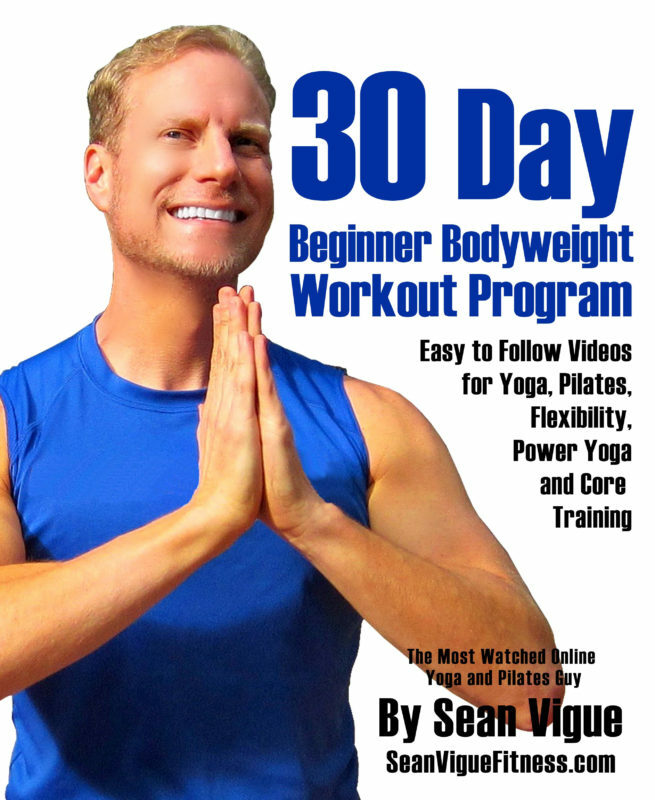 “Sean Vigue’s 30 Day Beginner Program” is the PERFECT easy to follow workout companion for the total beginner who wants to increase their physical and mental performance on every level or anyone who has been dying to try yoga, Pilates, Power Yoga, stretching and calisthenics but didn’t know where to begin. This complete 30 day training program will have you up and reaping the benefits today. There’s no time like the present! This program consists of 30 COMPLETE WORKOUT VIDEOS (plus 2 extra credit more challenging programs at the end of the book). You simply copy and paste the link on each page and do the workout directly with me. The workouts are designed to ease you effortlessly into the program and they progressively become more challenging as you build that natural strength, flexibility and confidence. You will be AMAZED at how much progress you make after the first workout and it only gets better. And best of all – all you need is your bodyweight. No weights. No equipment. No gym. Only a workout mat and comfortable clothing is recommended. Along with each video is a description of what you’ll be doing, where the video was filmed and fun bits of trivia about how the workout came to be…sort of a behind the scenes peek. Every video has a story and Sean is excited to let you in on the secrets and bloopers behind each experience. It’s time for you to look and feel better after the very first workout. Why not begin today? You can do these workouts anywhere and anytime, working them effortlessly into even the busiest of schedules. Or take these workouts to the gym and do them before, during or after your current routines and watch your physical and mental performance increase massively. The sky is the limit. Grab your workout mat and let’s go! P.S. If you’d like to check out my other bestselling fitness books simply type in ‘Sean Vigue’ in the search bar!